The old church of the village is dedicated to Archangel Michael, who is considered as the patron Saint of the community. The construction of the church started in 1709 and it was completed in 1757. It was built in the center of the village among the old traditional houses. It is a big church and its capacity is 400 people. The owner of the church was George Fellas, a moral and diligent inhabitant of the village who was born in 1960. One day when he was returning home from the fields, where he worked, he stopped at a spring in the area “Vrisia” to drink water. As soon as he bended, he realized that he could not move his body or speak. Thus, as a good Christian he asked for the help of Archangel Michael and promised that he would build a church dedicated to him. Suddenly, his strength came back and he managed to return to his house where he explained with signs to his family what had happened. The same night he dreamed of the Saint who showed him the place and the design of the church that he had promised to build. The next day he could speak again. With the help of the other inhabitants of the village, he fulfilled his promise. The holy icons of the church of Agios Ioannis were transferred in the new church, which was then established as the main church of the community. 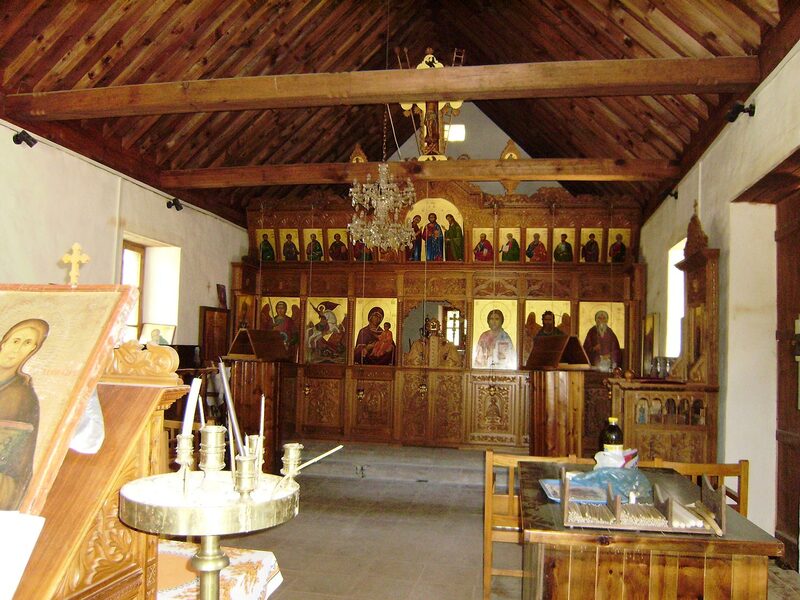 The icon of Archangel Michael that was found in the area “Alonakia” was also taken in the new church. Archangel Michael is considered since then, the patron saint of the village. The church is built in Byzantine style, it is stone made but there is no bell tower. It is a three aisled church, white painted and there are no wall paintings. The church has a very old, gilded and wooden carved iconostasis, which is dated in the 17th century, and it is preserved to this day. The pulpit of the church is very old and it is a real piece of art. The two psalters are also very old. The inside of the church is flat and there is no gallery. This church comes under the Department of Antiquities and it celebrates mass 5-10 times a year. The yard of the church is decorated with an old olive press. During the first half of the 20th century, the village “Agios Ionannis” bloomed and became one of the biggest villages of the entire area. The increase of the population was the main reason for the construction of a bigger and grandiose church in the village. The new church was dedicated to Archangel Michael, as the old one, and it was established in 1921. 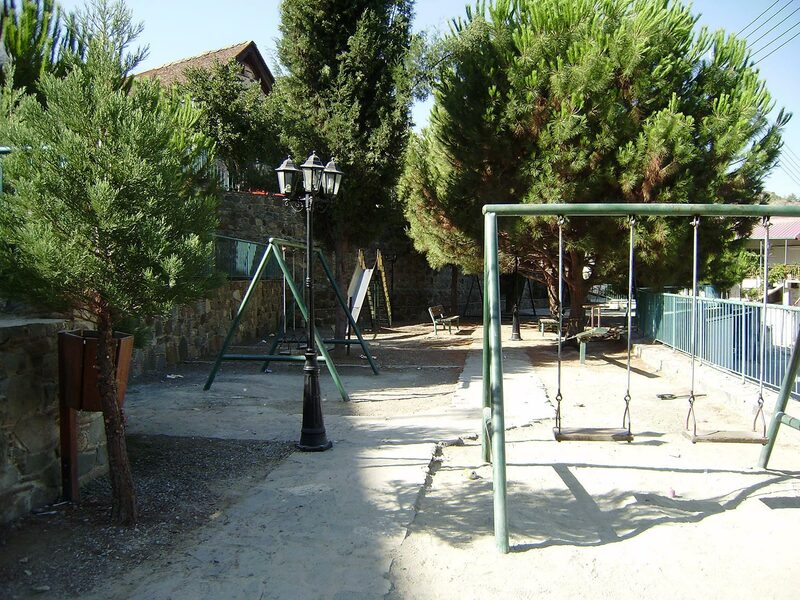 The inhabitants of the village have contributed economically and they also helped practically to its completion. It was built in the center of the village in Byzantine style. The church was inaugurated on 6th September 1940 by the archbishop of Cyprus Leontios A’. It is stone made and plastered. The tall bell tower has a dome at its top and two bells on the inside. The yard of the church is quite big and at the entrance it is paved with slabs. On the inside, the church is big and its capacity is for about eight hundred people. The wall paintings are recently made and they are all really beautiful, offering to the visitors a holy atmosphere. The painting started from the Temple. The first one was the depiction of Panagia Platytera. 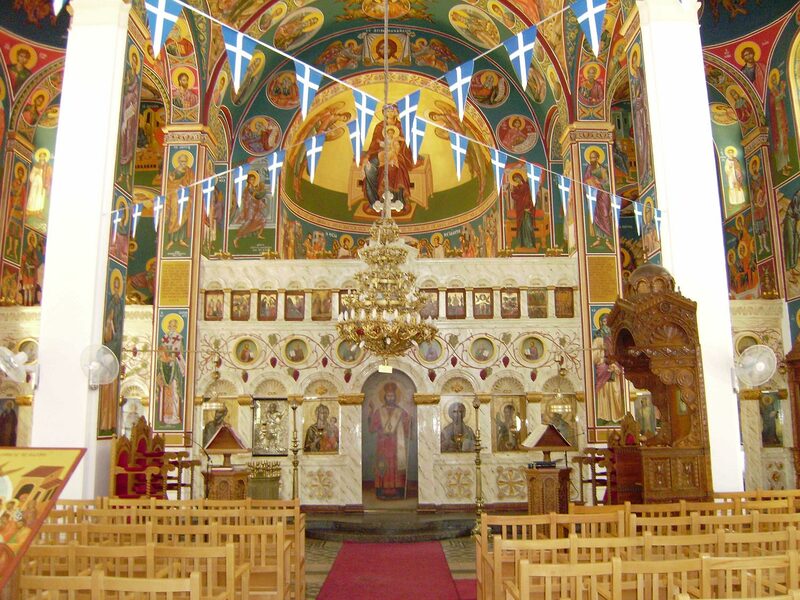 In the apse, in front of the Altar there is a wall painting, which depicts the Three Hierarchs, and under the wall painting of Panagia Platytera there is a depiction of the Holy Communion. The wall paintings are not fully completed yet. We must note that the contribution of the entire community but also of the Church is great. 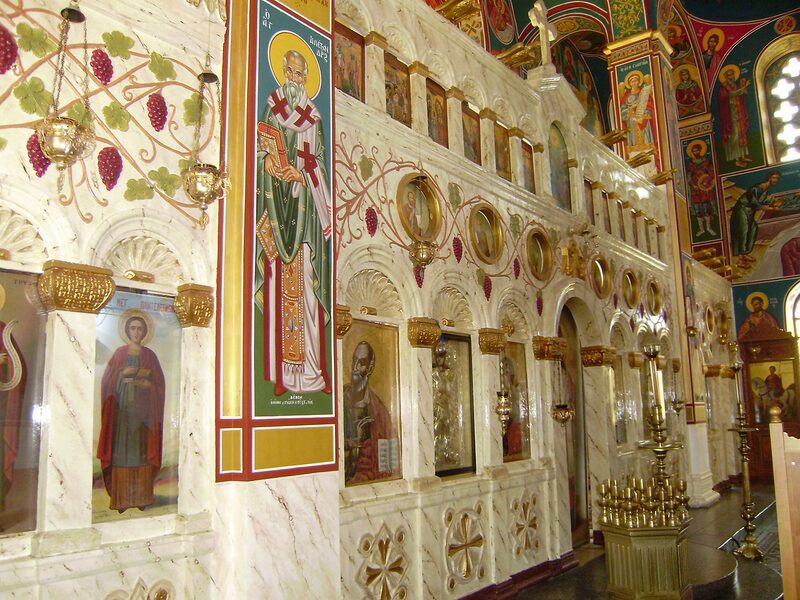 The iconostasis of the church is not the usual and classic wooden carved but it is made of marble. It is decorated with depictions of vineyards and it is framed with portable icons of various saints. The majority of these icons are made in the 12th century. The icon which is dedicated to Archangel Michael, is gilded and placed on the iconostasis next to the icon of Panagia. On the feast day of Archangel Michael there is a procession of the icon. The ancient icon of the saint, which was found in 1700 in the area “Alonakia” is placed in a special panel in the center of the church. The psalters are new and wooden. The gallery of the church is very big. The filling panel, in front of the gallery, is decorated with relief depictions of garlands. The feast day of the saint is on 6th September, the day that the Chief Commander Michael has made a miracle and on 8th November, the day of chief commanders’ assembly. The miracle of the saint took place in Phrygia, a town in Asia Minor. The inhabitants of this town were Christians and they lived under the threats of pagans. A pagan man who also lived in the area, wanted to kill the Christians and he planned to open a big barrier, which was in Phrygia, in order to drown them. Archangel Michael was furious and decided to save the Christians. Using his sword, he opened a hole and the water from the barrier was absorbed. Thus the Christians were saved from death. The exact date of the construction of this church is unknown. It is built in the center of the village, near the church of Archangel Michael and its style is Byzantine. The chapel has a rectangular shape and the roof is covered with tiles. Its capacity is 200 people. 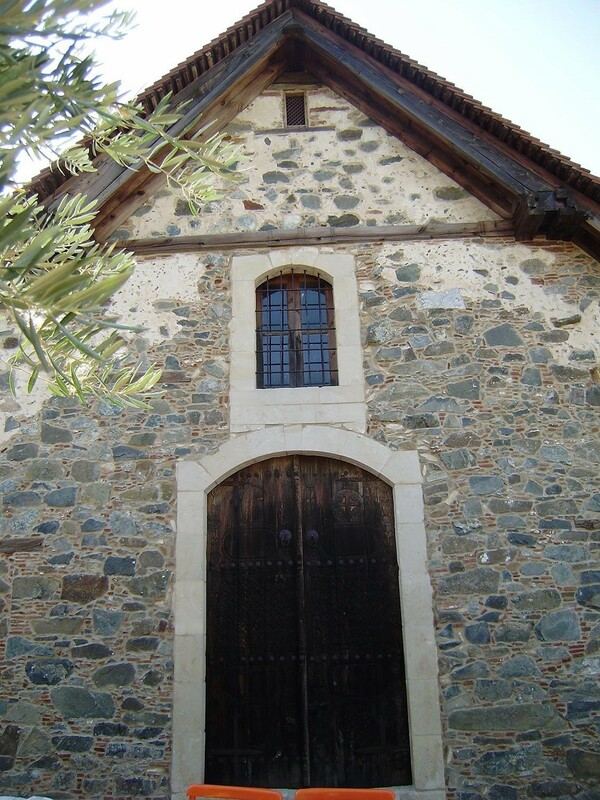 The chapel of Agios Ioannis, was used also as an elementary school. In 1948, the new elementary school was built and as a result the old chapel was gradually deserted. During the war for independence (1955-59), the church was used as a point of concentration of the Association “OCHEN”. 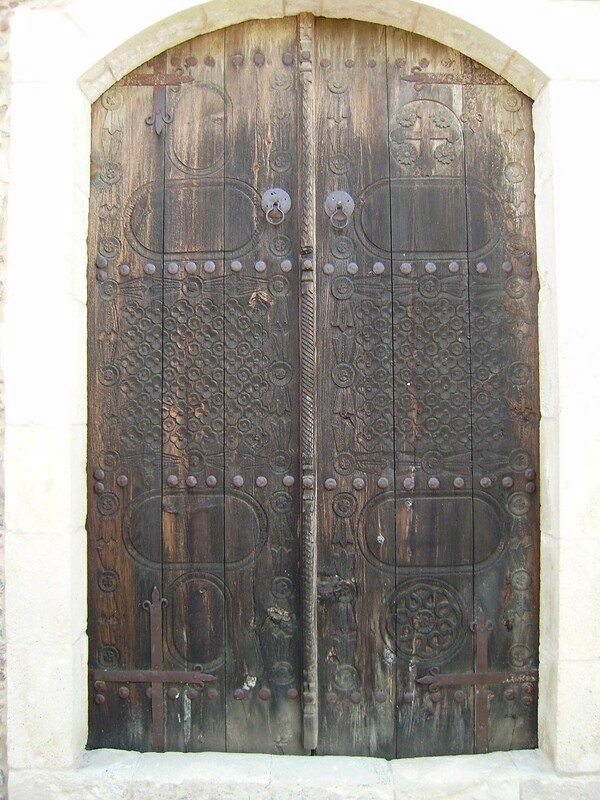 In 1993-94 the church was restored and took the form that it has to this day, with the contribution of the Department of Antiquities of Cyprus and of the church of Archangel Michael. The chapel is stone made. 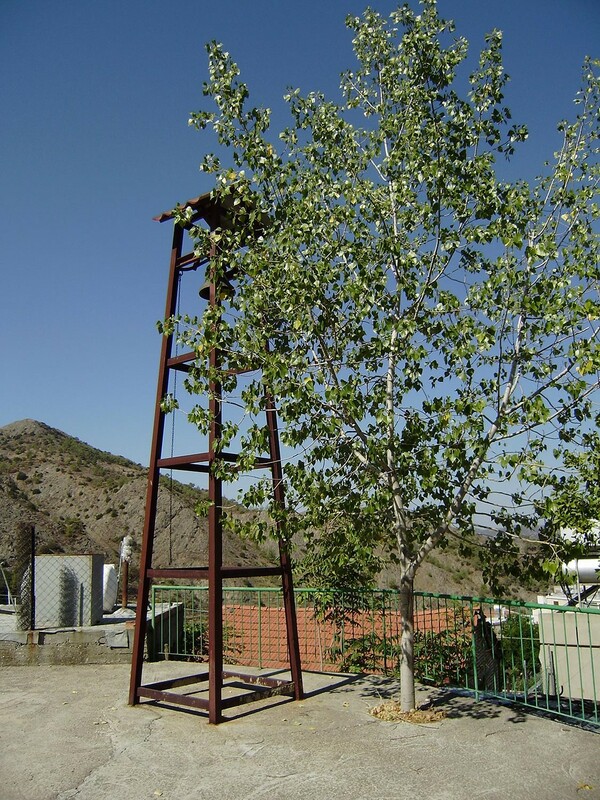 The bell tower is recently made and it is made of metal. Inside there are no wall paintings. The iconostasis is wooden carved and it was made in 1993. The psalters and the seats are new. The old icon of the saint, which was made in 1883, is placed in a panel in the center of the church. Agios Ioannis Lampadistis came from Lampadou Solias (near the village Galata) and this is how he got this name. When he was 22 years old, he became a martyr. It is said that Agios Ioannis Lampadistis can heal migraines. The chapel celebrates mass 10 times a year. On the feast day of the saint a procession of his holy icon takes place in the village. The holy icon of Archangel Michael was found two kilometers outside the village, in the area “Alonakia” in a deserted chapel. The icon was found from the inhabitants of the vicinal village Kato Mylos who carried it in the church of Archangel Michael. 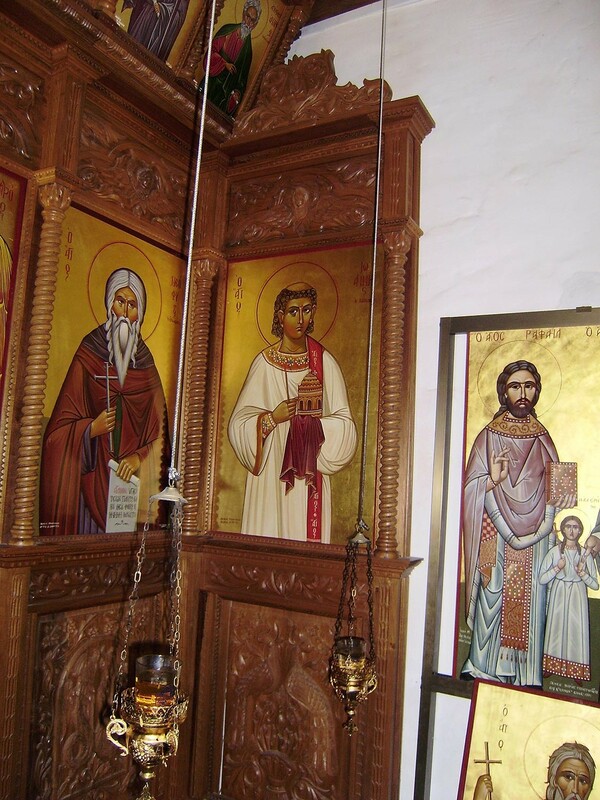 The inhabitants of the two villages had some serious arguments regarding the place where the icon would be kept. 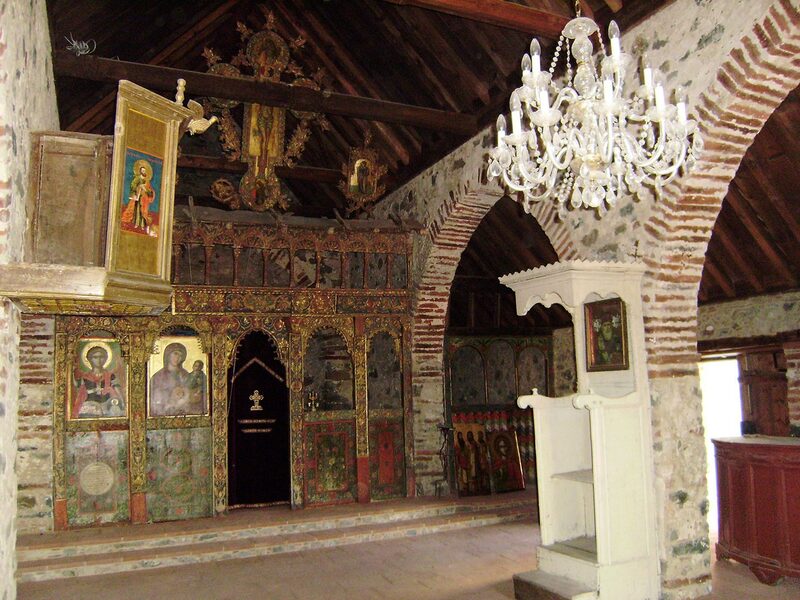 In the end, the inhabitants of Agios Ioannis “earned” the icon, as the other village had no church at the time. In the place of the old deserted chapel, where the icon was found, another chapel was built in 1988, dedicated again to Archangel Michael. This new chapel was built after the initiative of the ecclesiastical committee of the Church of Archangel Michael. A woman once asked from the saint to heal her ill child, and the saint did heal him. So, in order to thank him, she has paid a great amount of money for the construction of this chapel. The chapel is stone made. It has tiles on the roof, it is two aisled and its shape is rectangular. The iconostasis is wooden and modern as the rest of the equipment in the chapel. The chapel celebrates mass once a year, on Saint Thomas Sunday. The old icon of the saint, which is placed in the church, is transferred outside the chapel for the procession. The chapel of Panagia is built on a small hill outside the village, but it is not yet completed. According to some evidence that we have, there was another chapel on the same place, which was demolished. The construction of the new chapel was made by a great benefactor of the village. His name is Kiriakos Pittalis and he is a businessman. He comes from the village but now he lives in London. His goal was to build a church and he actually did it. The chapel will celebrate mass once a year, the 15th August. The chapel, which is dedicated to Agia Polixeni, is built in a picturesque landscape next to a water spring in the area “Latsin”, but the construction is not yet completed. It is believed that in the same area there used to be an old settlement. 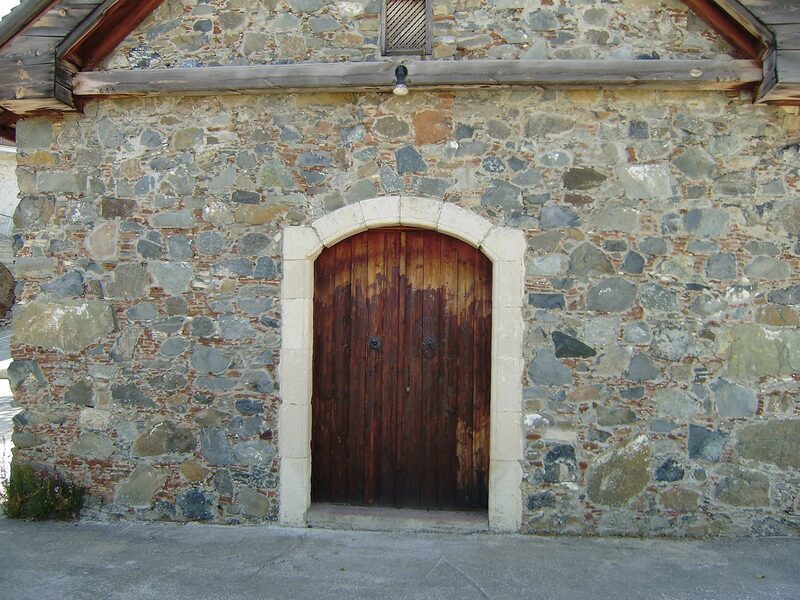 The owner of this chapel is Andreas Christoforidis. The feast day of Agia Polixeni is on 23rd September.